"Capt. John's Fishing Reports" gives you the latest information about our fishing charters as they occurred. So bookmark this page and check back with us regularly. Trolling and casting shads have been the key to success. Surprisingly, the clam and bunker chunk bite, as of late, has been almost non-existent but that can change on any day. You just can never tell from one day to the next what these fish want. With the New York waters opening on Monday April 15th, the possibilities for catching Stripers are much better as these fish come out of the Hudson River looking for a meal. It's been a long winter. Reports from many of my sources, which also confirm what Chris, Rich and I found on our scouting trip the other day, is that the fish are spread over a wide expanse of Raritan Bay....some caught on the troll, others caught casting shads, but a very good body of fish are there. This is good fishing early in the season even with the water temps at sub 50 degrees....go figure. As a reminder, not only do we offer full 4 angler, 6 hour charters, but we also have our Wednesday and Friday "Open Boat" fishing trips exclusively for our single anglers . We currently have spots open for Wednesday, April 24th and beyond. Look, the fishing has been very good, even by our standards, so don't procrastinate. Once these fish move north, it's bye-bye till mid November. You can view our current "Open Boat" schedule by going to our web page for booking your spot....click here. We here at Reel Fun are now entering a very busy period with many bookings, so I'll keep you abreast of all that's going on "On the Water" as they say. I still do have some weekend dates open, as well as our "Open Boat" weekday trips, so stay tuned. And finally.....LET'S GO LADIES!. A call to all the lady anglers. IT'S TIME TO FISH. If there is interest in an "Ladies Only" fishing trip, then let me know and I will be glad to accommodate a group of my lady anglers for Striped Bass. A fun day on the water and a day away from the office, hubby and the kids too. Give me a call. 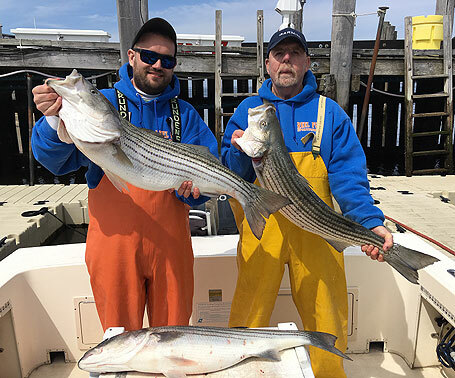 As you can see by the photo left, son and mate Chris (left) and mate Rich (right) holding some pretty hefty Striped Bass we caught today...4/7/19. All fish caught in Raritan Bay....nice calm waters and a beautiful sunny day. A three man limit of fish with the smallest at 30" long and a hefty 38" bruiser. Great early season fishing is going on right now, so if you're a Striper fishermen/women, now is the time to get in on the action. These fish are highly migratory and won't be here long. CALL NOW...908-421-4761. Just a few quick words about where we are pertaining to the start of a new season of fishing for Stripers and Fluke. The boat has all the equipment aboard as we await bottom painting...weather permitting. Air temp's have to be 50 or greater to bottom paint the hull, so it's any day now that we are in the water for another season. While at the marina, the word out is that there are many small to legal size Stripers now in the bay and surf casters as well as the kayak guy's are catching fish. A very good sign as water temps are still hovering around the 42-47 degree mark.....still a bit cold but the fish are hungry to say the least. A long winter for them too. The bigger spawning females are just now entering the Chesapeake. No word yet on the fluke reg's.....par for the coarse. Rumor has it that we (NJ) are staying at 3 fish @18" like last year even though we did under fish last years quota. I won't take this issue any further as NOAA and NMFS won't care for what I have to say. I have been in contact with my web hosting service and my web site is now "secure" according to Google and industry standards. A secure web site means that all information that you send to me through my web site is now encrypted, ensuring your internet safety as it pertains to Reel Fun Sportfishing. Any web site that has in it's address "https" is a secure web site. Also be aware that I and my credit card processor DO NOT retain your credit card information after any transaction....another measure of security for the both of us. Again, all credit card transactions are encrypted for your safety. Please take note that all the safety features that I use to ensure your privacy and safety comes at a cost. Part of my commitment to my loyal customers. This is what you pay for....professional service! Finally, the boat as well as our season should be good to go by this weekend or by mid week of the next. Let the fun begin. There are a lot of fish out there waiting to be caught. We are about to embark on another fishing season here at Reel Fun Sportfishing. Spring is finally here, the crocus are in bloom and a fisherman's thoughts turn to.....what else....fishing! Weather permitting, a few of the crew and I will be at the marina this weekend preparing the boat for another season. Our first charter is just 2 weeks away. Reports and scuttlebutt I've collected say that Stripers are in the western sections of Raritan Bay being caught using various methods. Not the big females as of yet, but smaller legal hard fighting resident fish searching for a meal just the same. Bay water temp's as of this email at the Keansburg monitoring station was 42 degrees. But that can change within days with a warm front and some sunshine. Now for a favor I ask of you... Google "reviews" is a very important part of the overall advertising strategy on the internet for many businesses, and mine is no different. Google is unquestionably the standard now in the "Search" tools arena that people use to find services and products to purchase. Would you be kind enough to offer your thoughts about Reel Fun Sportfishing in the review section of Google under Reel Fun Sportfishing? Fishermen searching Google for a Striper or Fluke charter in the Sandy Hook area will come upon numerous charter businesses, but a 4 or 5 star rating speaks volumes about us and could really go a long way. Also, if you are a Facebook subscriber, you can also find our page by searching for us and offering your thoughts about our business. Good, bad or indifferent, your comments are always welcome. Or, if you would like to submit a "Testimonial" on our web site, please feel free to email me your thoughts and I will be glad to copy it to our "Testimonials" page. In closing, the crew and I want to "Thank You" in advance if you decide to post a review on Google Search, Facebook or our Testimonials web page. But most of all, we hope you have an outstanding fishing season...hopefully with us. 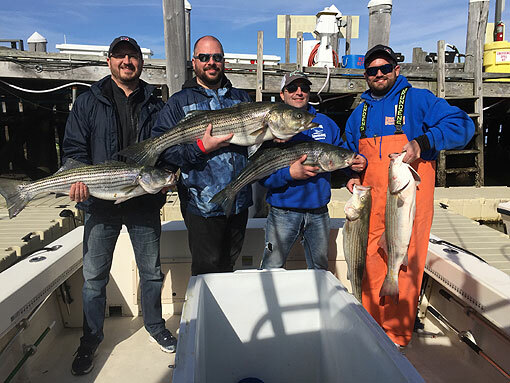 Reel Fun Sportfishing is currently taking reservations for the Sandy Hook, NJ spring Striped Bass run starting with our first "Open Boat" trip on Wednesday, April 17th, 2019. 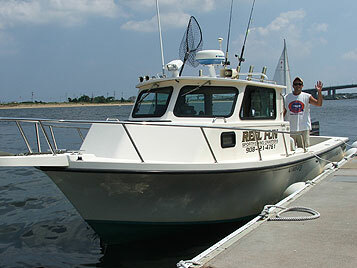 We also accommodate full 4 person private reservation charters. All our fishing trips are 6 hours all inclusive including the use of our rods/reels, fresh bait and tackle at NO additional charge. We depart the dock at 7 am returning by around 1-1:30 pm. All our trips have a mate aboard able to handle all your fishing requests as well as teach you the current hot fishing methods being used to catch Stripers as well as Summer Flounder (Fluke). We operate "Open Boat" trips every Wednesday and Friday mornings at the current fee of $130.00 p/p payable via a credit card over the phone "in full, in advance" of your date. Trip availability (spots) can be found by going to our "Wednesday and Friday Open Boat Fishing" web page....click here. First off, let me say that this was a very busy show with outdoor enthusiasts from many parts of the north NJ area as well as, surprisingly, many from the Jersey shore area too. It was a very active day for mate Rich and I at the Reel Fun booth booking many fishing trips for both spring Stripers and summer Fluke trips. We were offering a "one day" show special of $100.00 per person for an all inclusive 6 hour fishing trip for either species of fish......a savings of $30.00 per person. (All subsequent pricing now returns to our normal rates as listed on our web site.) A good deal to say the least for those that attended and took advantage of our show offer. Now on to a few well deserved "kudos". Show organizer and manager of the Ramsey store, Marty Brennan, did an outstanding job, once again, setting up the store with numerous displays across the spectrum of outdoor life as well as some very interesting seminars throughout the day. Thanks Marty for a job WELL DONE. This is a yearly show that you should mark your calendar to attend next year...well worth it. There were signs of 20% and more off on many desirable fishing items that I took advantage of to replenish and/or replace and upgrade gear on the boat. Many new and current anglers of Reel Fun stopped by to chat about how the fishing was last year and to discuss what may be in store for the upcoming 2019 season.....Striped Bass and Fluke being the center of our discussions. Many thanks too to the Ramsey staff for their professional and courteous service that I witnessed throughout the day. In today's very competitive business environment, service is key. Once again...kudos to Marty and his staff. Well done. My staff and I anxiously await next years show as a good "kick start" to our fishing season. My appointment book is filling up nicely for the 2019 fishing season. So as not to be left out on those "prime tidal days" for both species, I am now taking bookings for the entire spring, summer and fall season. Have your credit card ready as a $100.00 deposit will hold your spot on the day of your choice. Finally, to all our "new" anglers that booked a trip with us....Thank you. It was a pleasure meeting you as the crew and I look forward to fishing with you starting in about 6 weeks or so. Welcome to being a part of the Reel Fun Family of Anglers. See you at the dock. A reminder that the SWABC Flea Market will take place on Sunday, Feb. 17th. at the Hasbrouck Heights VFW Hall. (Google map for directions), so mark your calendar for this one. A great show with tons of stuff, a 50/50 raffle, food and more....stop by and shake off that cabin fever. Also a date to remember is Saturday, February 23rd for the Ramsey Outdoors "Cast and Blast" one day show at their Succasunna, NJ location. Reel Fun Sportfishing will be offering a "Show Special" for those who book a fishing trip at the show...significant savings, so don't miss out on this one. This is a one time offering with all subsequent fares returning to their normal pricing. On the fishing scene....haven't heard anything about the NJ Fluke reg's as of yet. Way too early and with the gov't. shutdown, that didn't help either so we wait. I would suspect sometime by mid March on our Fluke reg's for 2019. I personally would like to see NJ go with 4@19" for 5 full months (same as NY reg's). More time on the water....good for anglers and good for business. With the added advantage of utilizing the entire Raritan Bay and surrounding waters to fish.....common waters should have common regulations, or is that too simple a concept to understand. Coming along soon will be a Striper assessment taken in the Chesapeake area. There were reports of an incredible number of "schoolie" sized Stripers during the fall migration, so if you're looking for action, this spring could be a bonanza. Schoolies on light tackle while clamming or bunker chunking is a blast not to be missed. Throw in some big keepers and you've got yourself a great day on the water.